Production Control Panels | The Industrial Controls Company, Inc. The Industrial Controls Company believes in giving customers what they require, not just what they ask for. Our cell-based, lean-manufacturing approach focuses on engineering both the control panel itself and the manufacturing protocol used to produce it, all with the aim of maximizing efficient use of time, materials and effort — efficiencies we pass along in the form of cost-savings for our customers. When a customer delivers schematics for a control panel, we submit your drawings to a careful review. If problems come to light, we don’t just inform you — we propose solutions. We also look for opportunities to help customers mitigate cost through smarter design. The control panel manufacturing process itself begins with a prototype. A prototype isn’t just a one-off; it’s a design engineered for repeatability — one that can be produced at volume. For every production control panel, a customized build process is created. We document each step in the cell-based manufacturing protocol created for your project — from layout of the workstation to detailed photo documentation of the assembly procedure. Throughout production, Workwise ERP software is used to track and trace the real-time progress of each build, even down to the component level. For prototype builders and assembly technicians, a critical part of the job is to keep open lines of communication with our design engineers. If technicians see a better way of doing something, we expect to hear about it. Even if it’s as simple as a smarter route for wiring, they know to let us know. Systematic inspections are performed on every control panel, every step of the way. We utilize in-process quality check-points, so each successive station checks the previous station’s work. 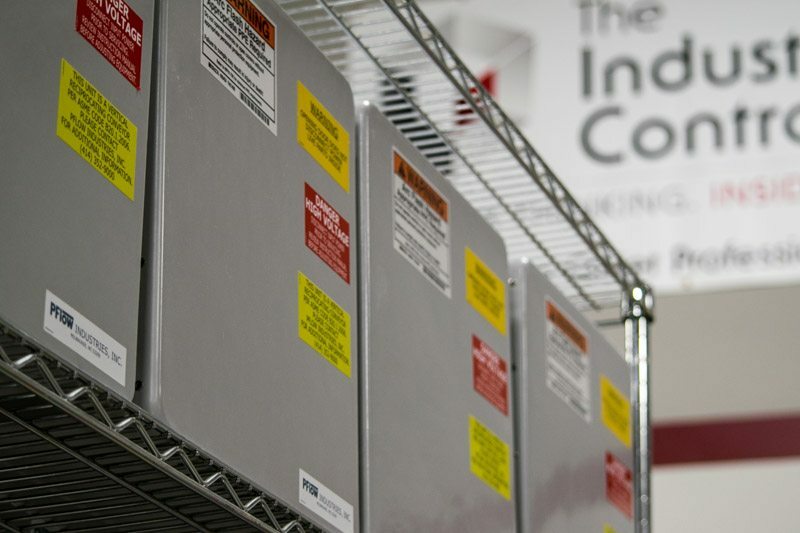 When your completed control panels ship, we also send along a copy of our final inspection checklist, so you can double-check our work. Performance data is charted weekly, giving our team frequent intervals for identifying best practices, collecting and sharing feedback, as well providing a forum for prompt issue-resolution. Quality issues identified by our inspectors are carefully tracked and prioritized on a Pareto chart. Top issues undergo a root cause analysis to accurately identify problems and assign solutions. We track production efficiency and quality performance for each individual employee. And we post the rankings so everybody knows where they stand. This critical feedback also helps foster a healthy spirit of competition — every member of our workforce strives to come out as the company’s top performer. We track on-time delivery and subject any stragglers to analysis. Deliveries consistently average 96% on-time. To dramatically shorten lead times and allow our clients to service their own customers on a just-in-time basis, production panels may be built to near-completion and warehoused on our premises. For example, a customer may require a line of control panels whose designs share 90% of their configuration in common. We’ll assemble the shared 90% and inventory the near-complete control panels, adding the customized 10% and shipping the completed units as your need arises. Everybody Strives for Quality. We Strive for Perfection. There’s a reason people talk about the pursuit of quality. To achieve quality in your business and products, you need to go after it with everything you’ve got. This stubborn pursuit of exacting standards is what makes The Industrial Controls Company a standout in our industry. We believe you’re buying more than a control panel from The Industrial Controls Company — you’re buying the pride, integrity and commitment we build into every panel we sell.